You were serious about a salad post! Awesome! And a potluck is never a potluck without the mini-wieners in BBQ sauce and grape jelly! Jamie, I would never kid about salad. I love what you say about potlucks! It is so true, or true in the best of times. On Sunday, I enjoyed the cheese salad that had a special “P. Maggie” post it note affixed to the lid. Potluck love right there! You inspired me, Beth! Seriously, I know these salads are sometimes comical, but they are very often delicious. I wish I had some more cheese salad in my fridge for today . . . When my mom moved to Canada she was invited to a party and instructed to bring a salad. She brought some mixed greens and a bottle of dressing. All the locals looked at her as if to say “what strange ways you foreigners have!”. My mother, in turn, was horrified when she found out what they had meant. She is still not a fan, in spite of living some forty some years in Canada and the midwest. That’s a great story! When one of my churches has a big, big potluck, there is sometimes one green salad (or lettuce salad, as they are sometimes called), looking awfully lonely in a sea of jello, pasta, coleslaw, and the rest. Oh, such memories of circle meetings at my childhood church with my grandmother. I went every month. 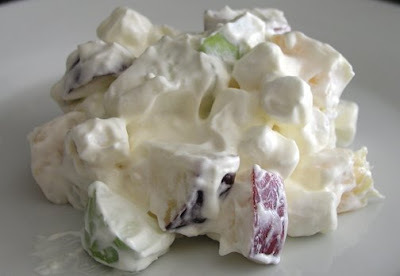 In addition to great casseroles which always includes meet, potatoes, macaroni and some kind of Cambells soup and Velveta, there was always ambrosia….before cool whip. The real deal. I was also a lover of carrot, raisin and pinepple salad. 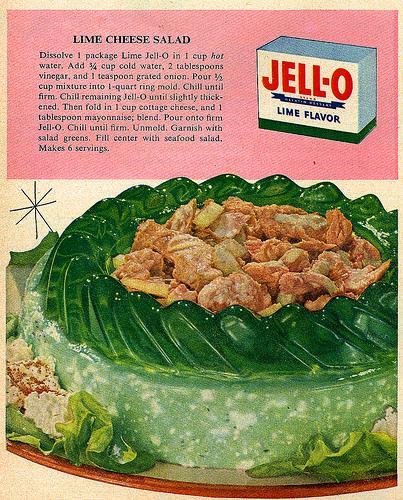 And the line jello with cottage chess and pineapple…..ah memories. This was also where we saw movies of our Baptist missionaries in places like Burma the Amazon etc. And a few time a year we got to meet them. I was a huge Lottie Moon fan. Thanks for nudging all of these sweet memories out of my brain this morning! You’re welcome, Jenny! Food is a powerful force that helps us remember and connect. And, you know, it’s often delicious. Ha! Best not to look too closely at those recipes, I think. I am feeling much better, thanks!